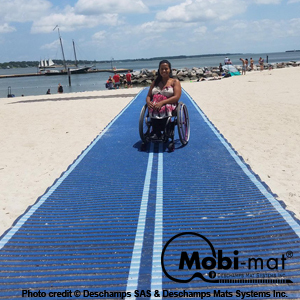 Mobi-Mat® Portable and removable roll out mat by DMS Inc.
Deschamps Mats Systems Inc. is an industry leading, technological innovator in the design, manufacture and distribution of the world’s most earth-friendly and remarkably effective semi-rigid and roll-out portable ADA pathways and temporary roadway and boatramps mat systems. 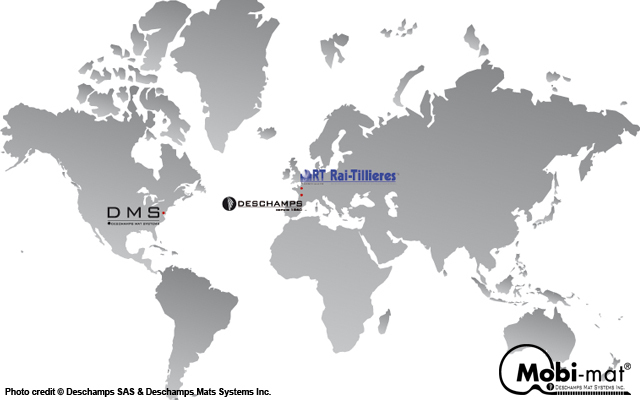 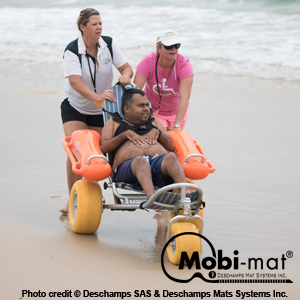 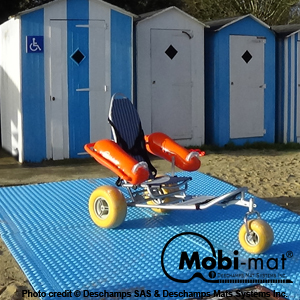 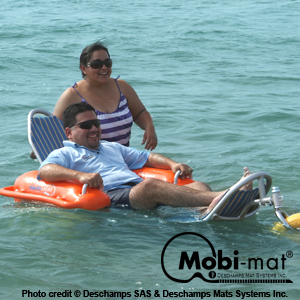 In addition, DMS Inc. offers the Mobi-chair®, a high quality amphibious floating beach wheelchair that provides a seamless transition from boardwalk-to beach-to water. 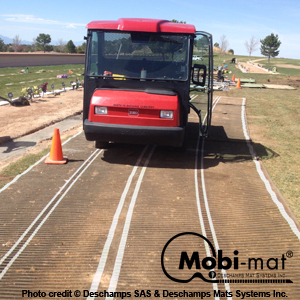 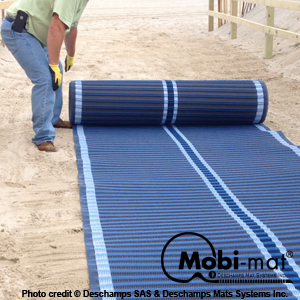 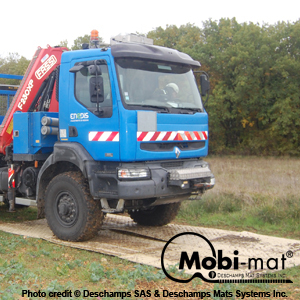 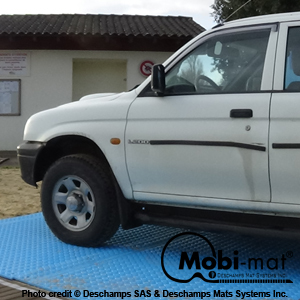 Building dunes and installing Mobi-mat® portable rollout crossovers mats are a good combination to protect your assets. 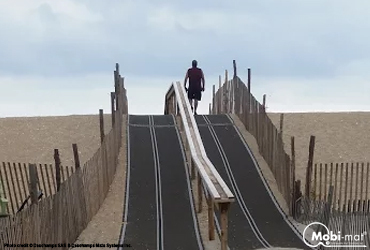 Following Hurricane Sandy the places that had a protective dune system. 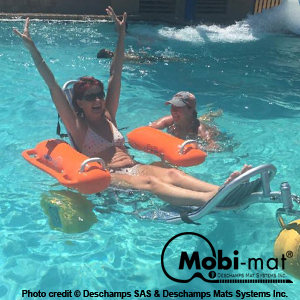 Congrats for Accessible Panama City Beach: Mobi-mat® portable RecPath™ now allows wheelchair-bound people not only to reach the water’s edge but also to take a plunge in the turquoise waters of the Gulf of Mexico thanks to the Mobi-chair® floating beach wheelchair! 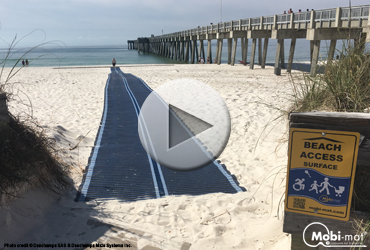 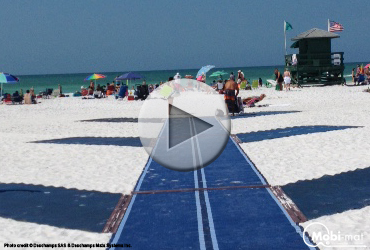 The 450-foot blue jay recycled polyester Mobi-mat® pathway is now the star of the area around the county’s new Siesta Key beach pavilion by improving access for beachgoers with disabilities, using wheelchairs, pushing strollers or simply hauling beach carts full of toys and supplies.